At LeatherGroups, we believe that buying leather furniture should be a fun, stress-free experience. With that in mind, we’ve put together a glossary of leather terms in order to make the process more enjoyable and help you to make the best, informed decision. The process by which leather is made to appear aged. Usually done by hand, using techniques such as lubrication and sanding as well as hand staining with aniline dyes. After deliming the leather, enzymes are used to add softness and flexibility to the hides. Full grain leather will breathe and adjust to temperature. Process for correcting leather and eliminating natural imperfections in the grain. Often times light sanding is performed, after which a more consistent grain is embossed on the leather. Buffing is also used to remove the grain to create nubuck or suede. A tanning process chromium sulfate and other salts of chromium, producing a more supple leather than vegetable tanning. Leather tanned with multiple tanning agents, usually a combination of chrome and vegetable tanning, combining the benefits of both. Leather that has been treated to age the appearance. Heavy gauge coils which are individually tied to one another from front to back, side to side and diagonally (eight ways) to provide a high level of quality, comfort and durability. An expensive process that can only be done by hand. The process of applying an artificial uniform grain to the surface of leather after imperfections have been lightly sanded, or buffed out. Application of any number of effects to leather after tanning, such as aniline dyeing, buffing, embossing, antiquing, distressing, etc. Leather which gains all of its color from being tumbled and soaked in large stainless drums with translucent aniline dyes. Considered the best, this is leather which has been aniline dyed, but has not been mechanically altered. Natural characteristics and markings such as scars, barbed wire marks, and wrinkles are left intact and are considered to be what adds character and beauty to premium leather. Term used to describe the patterned texture, either natural or embossed, on the surface of leather. Used to describe the feel of softness or fullness of upholstery leather. The application by hand of a darker color over a lighter color in order to create a unique aged effect. The process of softening the hand, or feel, of the leather by tumbling it in a rotating drum. Naturally occurring marks on most hides such as wrinkles, scars, scratches, and insect bites. These markings are part of the natural beauty of leather and indicate its natural origin. 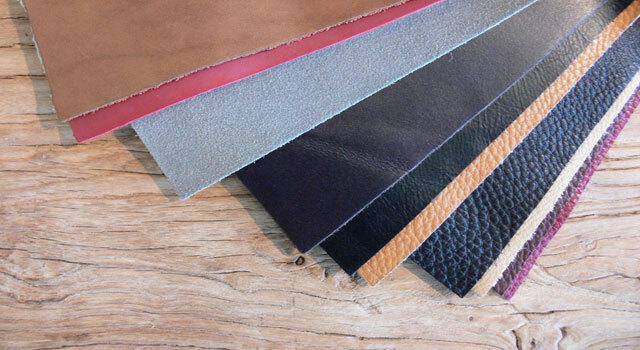 Leather in which the grain has been removed by buffing or sanding, which creates a nap, similar to suede. Because the grain is removed, Nubuck is unprotected and more susceptible to staining than other leathers. Over time, and with use, full aniline leather will absorb moisture and oils forming a rich patina finish, much like a well worn bomber jacket. A type of dye that is rolled, or sprayed onto the finish of leather to provide more uniform color and protection from fading. Aniline dyed leather which has has had the surface micro-pigmented and sealed with a transparent synthetic protective coating. Leather that exhibits bursts of lighter color when stretched, or scratched, as a result of the waxes, or oils in the leather. Leather which receives all of its coloration from tumbling and soaking in drums with aniline dyes with no surface pigmentation performed. An effect achieved by any of several techniques, after which the leather exhibits a two-tone or marbled effect that creates depth to the color of leather. A sturdy suspension formed from heavy gauge “S-shaped” wires that run front to back, tightly spaced to one another, and secured to the frame. The bottom layer of a hide after the top grain has been removed. It is also used to create suede. A process which converts the protein of the raw hide or skin into a stable, non-perishable material. Without tanning, leather would dry into a hard inflexible material. Application of synthetic, transparent resin as a protective coating. Can be either a high gloss, or matte finish. Leather hides are split into two layers, with the strongest, most supple part of the hide being the top layer, called “Top Grain”. A method of tanning that uses tannins from vegetable matter, such as bark, instead of chromium salts or other compounds. Tannins that are extracted from the wood, bark, and leaves of trees and are used during the Vegetable Tanning process. The thickness of leather, typically given in millimeters. This entry was posted in Leather Furniture Buying Guide and tagged aniline dyed, Antique Leather, buying leather furniture, corrected leather, full aniline, full grain, Leather Furniture Buying Guide, leather furniture information, top grain on June 3, 2010 by LeatherGroups.